This pool is economically priced and carries a 20 year warranty backed by Swim'n Play who has been manufacturing pools for over 35 years in the USA. This pool is made of hot dipped galvanized steel walls strengthened with deep corrugation, molded resin covers, galvanized steel ledges and verticals, and universal top and bottom steel rails and plates. With the Yorkshire pool in your backyard you can enjoy the fun and the freedom to use it anytime day or night. Give yourself and your family the quality time you deserve. Please note: Some items included in Complete pool kits may be switched out for another brand based on availability. You will be notified of such an occurrence. Made from durable virgin vinyl. The Ocean Blue A-Frame Ladder is built to last. It uses minimal hardware for easy assembly. Designed to fill with water, the A-Frame ladder requires no additional weights. It comes with a simple lift and lock feature for easy assembly and includes a padlock for extra safety. The Ocean Blue A-Frame has a 300 pound capacity and easily adjusts to fit above ground pools up to 56'. 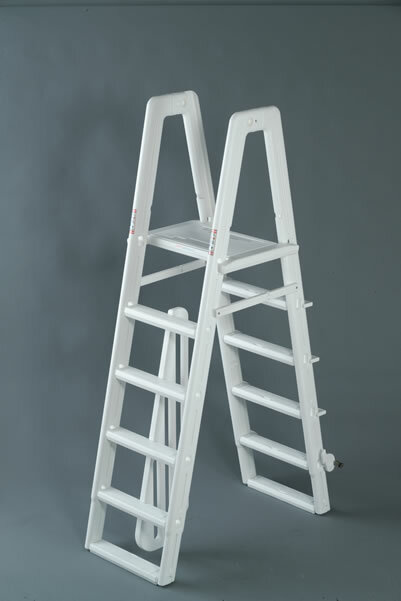 With safety in mind, the A-Frame Ladders outer steps can slide up and lock in place, protecting from unwanted entry. 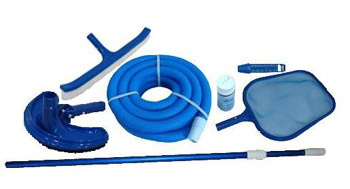 All the accessories you need to keep your pool clean all in one kit! Actual products may differ slightly in design. Based on availability. There are other Filters, Liners and Ladders available. 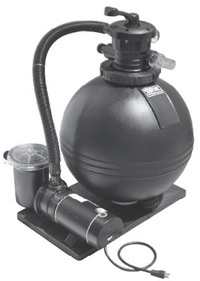 If you would like to upgrade or downgrade any component of this Above Ground pool kit please do not hesitate to call us and we will be happy to assist you. This Aboveground Pool Kit is available as "Pool Only" as well.